That's a game console controller in his other hand. He was ahead of his time. 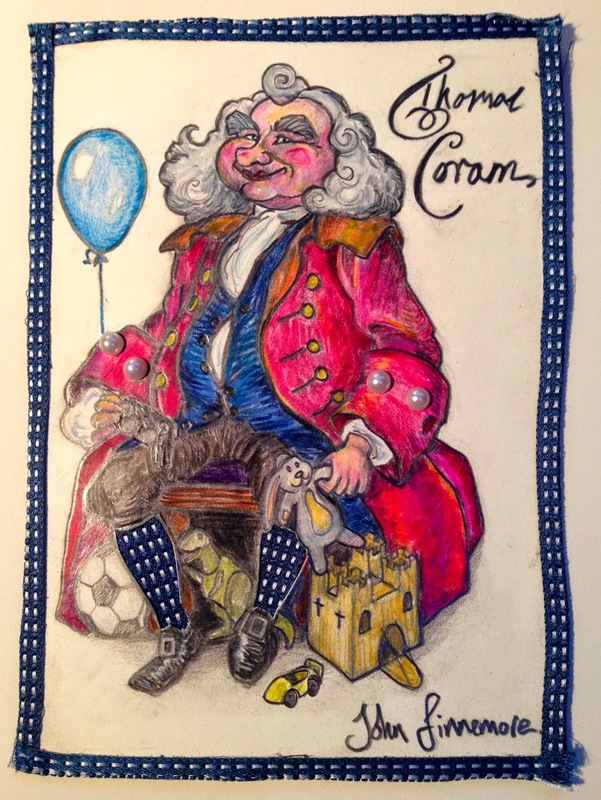 The excellent Coram Foundation for Children is the oldest children's charity in Britain, and began life 275 years ago as a Foundling's Hospital set up by Thomas Coram, a retired sea captain and merchant. 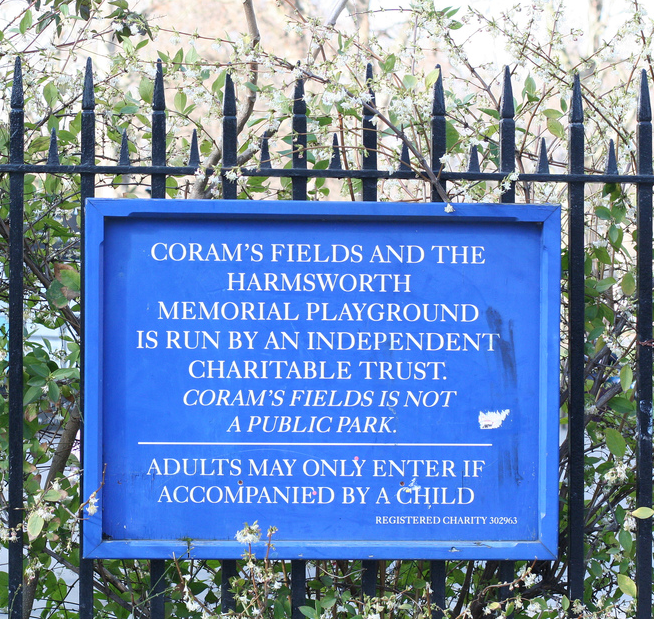 Among the many things they do is to maintain a large park in the centre of London named Coram's Fields, which has one of my favourite signs in London. If it doesn't seem remarkable... read it again more carefully. They mean it, too. Cap'n Tom, pictured here with his favourite bunny. PS - the 'Be Kind Have Fun' message next to this on the site is the inside of this card, not a second card. This week, I'm on The Unbelievable Truth again, which is one of my favourite shows to do, and indeed to listen to. You can hear it here, via the iPlayer for the next six days or so. Dogs and humans have been together since the beginning of time. The Ancient Greeks used spaniels to catch fish and tell the future. Old English sheepdogs were used in old England to herd pigeons and children. Aristocrats used miniature poodles as hand-warmers, whilst starving peasants would allow Yorkshire Terriers to swim in a cauldron of warm water for ten minutes, and then drink the result, known as 'Dog Soup'. And of course today, dogs work for us as everything from wine tasters to air traffic controllers. The actor John Wayne claimed he had won Lassie the dog in a poker game. However, Lassie the dog claimed she had won the actor John Wayne in a poker game. It was a classic stand-off. John Wayne called Lassie the dog a dirty liar. Lassie said the hell she was a liar, one-eyed jacks were wild, and John Wayne damn well knew it. John Wayne said all dogs cheated at cards anyway, did Lassie think he’d never seen that painting? In the resulting shootout, Lassie lost an ear, and John Wayne was killed. But not wanting to upset the children, Columbia Studios bought another cowboy that looked just like John Wayne, and never told anybody. Similarly, we’re already on our fifth Justin Bieber. David will like this - the Siberian Husky is not technically a dog at all. It is in fact... six cats in a costume. Two on the front legs, two on the back, one in the head, and one in the middle working the tongue and the tail. You might ask, how could one cat inside a husky reach both the tongue and the tail? To which I would reply... Is that really the part of this that's bothering you? As a boy, King William II rode out to hunt on a mastiff instead of a horse. Henry III would often wear a basket of Bichon Frises round his neck in a confused attempt to get girls to look at him. And of course the Queen has six corgis, named Tesco, Shiny George, Little Sir Woofsalot, Bernard Bresslaw, Argax the Destroyer, and Unnamed Dog. Only sixteen dalmations were used in the live action remake of 101 Dalmations. They were then multiplied with CGI, but only after special dog make-up artists changed the pattern of their spots. The film did, however, use two Glenn Closes, as the original got rabies during filming, and the studio just pulled the old John Wayne trick. My dog can't fly. But he can ride a horse. 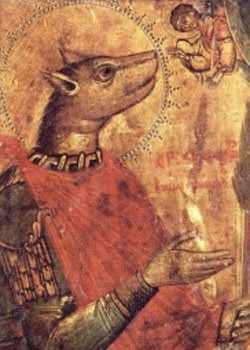 It is that in the Eastern Orthodox Church, St Christopher was often shown in icons as having the head of a dog, because of a mix-up between the Latin for 'from Canaan' and… 'Canine'. Yes, that is actually true. I know, but it is. No, it is. Trust me, it is. I can tell you still don't believe me. St Stephen trying to dry St Christopher's paws before he comes into the house. St Christopher performing the miracle of the Untaken Biscuit. Yesterday, John and Kevin's Sunday Papers went to the races. We discuss, among other things, just how easy it is to inadvertently buy a horse. Today, at 6:30 on Radio 4 and iPlayer thereafter, I will be lying to Jack Dee, Alex Horne and Lucy Beaumont about pubs, on The Unbelievable Truth. Sadly, the following headline from the Mirror did not appear on the first Sunday of the month, and so Kevin and I couldn't cover it. But then again, I'm sort of glad, because that would have meant reading the story, and I feel sure I'd have found the explanation disappointing.